Set up of the GRL Thread Test Harness and the OpenThread Harness Automation Tool for use with the OpenThread Border Router (OTBR) Device Under Test (DUT) is the same as the Certification Automation Setup guide. Use that guide in conjunction with the changes detailed here. Unless otherwise noted, all installation and configuration steps below occur on the Windows machine running the GRL Test Harness software, which should be installed before continuing. For Test Harness control of the NCP, set up either a serial port connection or an SSH connection. Only one of these connection types should be used to control the NCP. Do not use both connection types at the same time. In the configuration menu, select 5 Interfacing Options. In the Interfacing Options menu, select P6 Serial Enable/Disable. Download and install the FT232 driver. Connect the FT232 USB to UART adapter to a USB slot on the Windows machine. Set the voltage jumper on the FT232 to 3.3V. Once connected, restart the Windows machine. Install pySerial on the Windows machine. Use Python on the Windows command line to enumerate all hardware identifiers (VID and PID) for devices connected to the machine. In this output, one NCP device is connected, with an identifier of VID_0403+PID_6001. python -c "import serial.tools.list_ports;print [ports for ports in serial.tools.list_ports.comports() if ports == 'COM10']"
Start the GRL Test Harness. 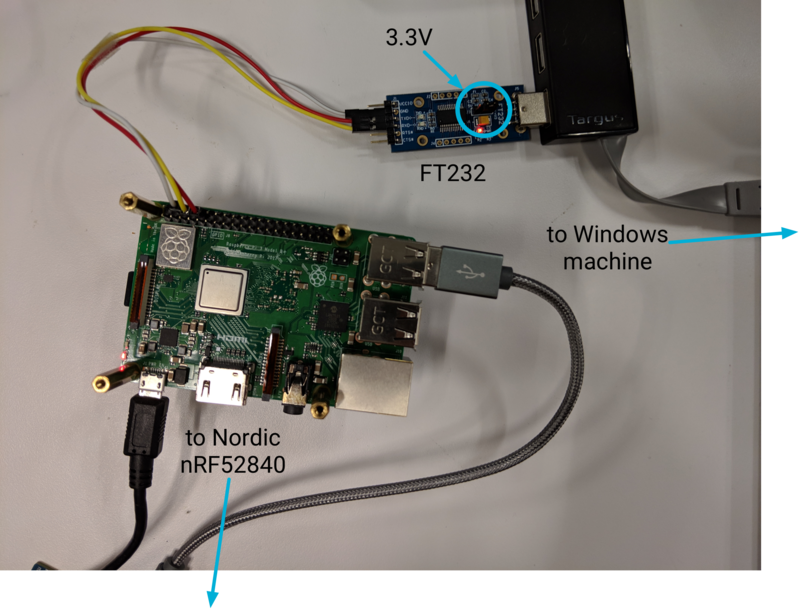 Note: If the device is connected to the Windows Machine prior to starting the GRL Test Harness software, as described in these procedures, the Test Harness should automatically discover the device. If the device is connected after starting the Test Harness, you might have to add it manually as noted in the next step. We recommend not starting the Test Harness until the device is connected and all setup and configuration up to this point is complete. 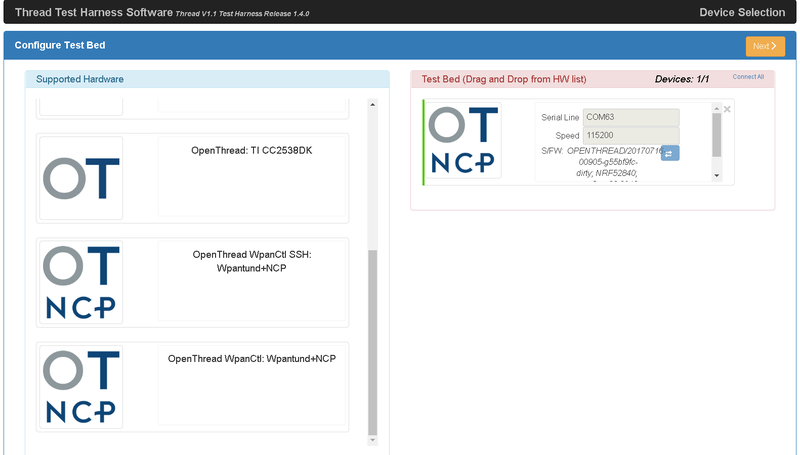 On the Configure Test Bed page, the device/port now appears as an OT NCP device. Ensure the correct Serial Line (COM port) and Speed (baud rate) values are populated. 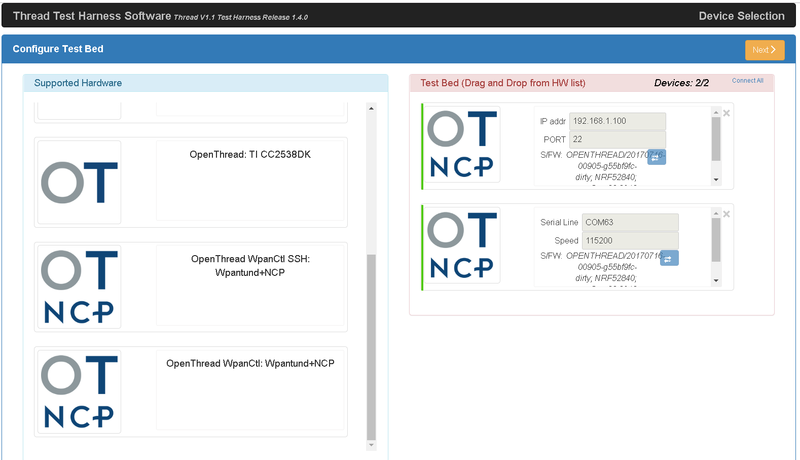 Click the arrow button below the Speed field to establish the serial connection between the Test Harness and the OT NCP device. Select the Enable Auto DUT Device Selection checkbox below the Supported Hardware list. Select the Set as DUT radio button under the target device/port to set the OT NCP device as the DUT. Note: To use SSH, the RPi3B must be on the same LAN as the Windows machine. To enable SSH on a headless RPi3B, see Step 3 of the Raspberry Pi SSH documentation. On the Configure Test Bed page, drag the OpenThread WpanCtl SSH: wpantund+NCP device from the Supported Hardware section to the Test Bed section. Populate the IP addr with 192.168.1.100 and PORT with 22 for the device. Click the arrow button below the PORT field to establish an SSH connection between the Test Harness and the OT NCP device. See the Install and Configure steps from the Certification Automation Setup guide for instructions on how to set up the Harness Automation Tool. See Running Certification Test Cases to learn how to run certification test cases on the OTBR DUT. If you need to reboot the RPi3B, close the Test Harness software and wait at least 20 seconds after the reboot is complete to start the Test Harness again. Check whether a Shell login works for the serial port, using a tool like PuTTY. Use the COM port for the FT232 device and a speed (baud rate) of 115200. If the login fails, reboot all devices and try it again.